We have friends in Europe and I’ve wondered how they might possibly defend themselves in a terrorist attack. One fellow in England worries about sharps — knives, machetes, even swords, as attack weapons. No guns? No problem for criminals and terrorists. Knives are easier to hide, anyway. At the most basic level of self-defense, situational awareness can keep you out of a lot of trouble. Israelis have been living under the very real threat of terrorism for decades and the Israelis I know have a sixth sense when it comes to noticing anything out of place — people, clothing, eye contact, movement. That has to become second nature and thankfully, it can be learned, and taught. Two books that have been helpful to me and my wife are The Gift of Fear and Left of Bang. If you have kids and want to learn more about protecting them, read Protecting the Gift. Being aware of surroundings is important, but there may come a time when you have no choice but to physically defend yourself. A single mom I know challenges her teenage daughter every so often, “Look around and tell me what you could use as a weapon RIGHT NOW.” She does this everywhere. Restaurants, grocery store, everywhere! I’ve played this game many times myself and look for not only weapons but exits, places to conceal or cover, in the case of gunfire. I’ve measured the thickness of a table top with my eyes — could I pick it up and throw it? I’ve been in bed, ready to doze off, and thought, “What would I do if I heard glass break on the other side of the house and heard someone in the kitchen?” Then, I have trouble going to sleep. It can make you crazy sometimes to think like this, but mental rehearsal is part of physical training. Martial arts, such as jujitsu or taekwando, are other options that will train you to defend yourself and you’ll learn how to control your own fear and aggression. Some martial arts studios offer low cost self-defense classes for women. Along those same lines, you just gotta be in the best physical condition as possible. A fat cop chasing a 20-something, strong young man will be lucky if he doesn’t keel over with a heart attack, and the thug will go on to victimize others again and again. Remember that criminals and terrorists have watched and planned and played out in their minds over and over just how, when, and where they will attack. They’ll be looking for vulnerable people — those who are distracted (Bastille Day celebrations in Nice, for example) and if you’re in that segment of selected victims AND you can’t run or have the physical power to fight back, you may end up being another body covered with a sheet. Vulnerability. How do you make yourself less vulnerable when you’re out in public? Here’s a suggestion that may not be popular with some — avoid alcohol. I’m a beer guy. I like beer. But in my lifetime, and I’m well over 40, I have seen some spectacularly foolish and dangerous things done by people whose judgement and physical abilities were impaired by alcohol. If you have a concern about crime and terrorism, why increase the size of the target on your back by staggering down the sidewalk, barely able to stay upright, much less notice warning signs that something bad could be going down? If you’re still thinking that maybe a weapon is needed, some folks swear by the bow. One man says it’s a real deterrent and a 38-inch arrow notched on his bow makes people think twice. He happens to use a tripod bag for transporting his bow and arrows and made that choice because it’s innocuous looking. Tactical pens are another choice and one that I happen to know is used by many, many guys in my particular line of work. It’s a pen AND a weapon. If you have it in hand and know how to use it, it can be a handy weapon, and better than nothing. When you shop for a tactical pen, you’ll see a number of them that look like REAL weapons but if your intent is to have something handy for self-defense that doesn’t attract attention, then look for one that just looks like a very sturdy ink pen and not a pen on steroids. Pepper spray is popular but can cause problems for asthmatics. 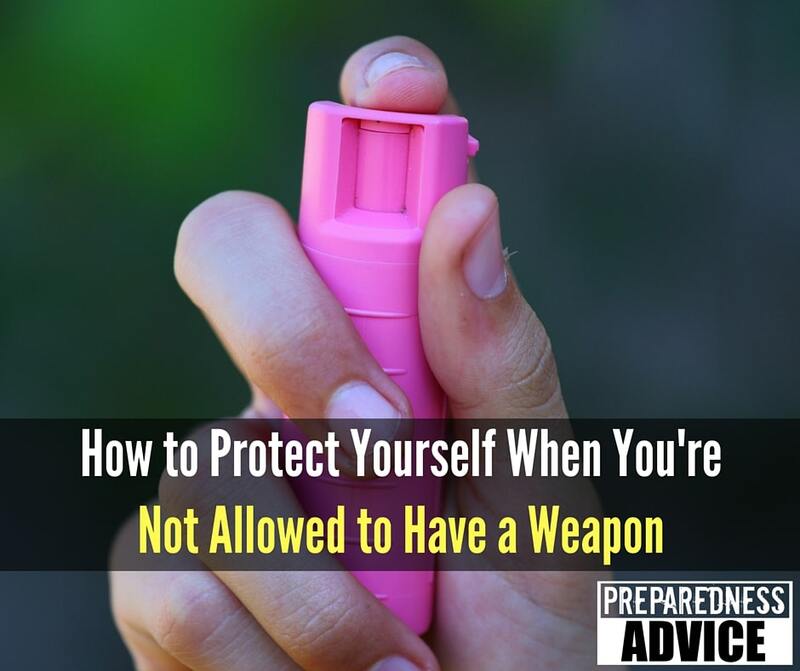 Again, if you live outside the U.S. or are traveling to other countries, find out what is legal there before packing pepper spray, the tactical pen, a kubaton, etc. Depending on a country’s laws, using even something like a tactical pen for defense can land you in hot water. Many years ago, an Arizona man had to appear in a British court because he defended himself from an attack by using a pocket knife he had with him. He got in more trouble than the man who attacked him. Hard to think of anything more messed up than that, but the last thing you want is to end up in prison when there may have been other ways to avoid a dangerous situation, such as situational awareness, not getting drunk in foreign bars at 2 in the morning. Common sense first and maybe, just maybe, you won’t have to worry about remembering your jujitsu moves or fumbling for the tactical pen in your pocket. Whatever tactic or strategy you choose, practice, practice, and practice. Nothing beats automatic muscle memory. This entry was posted in safety, self defense. Bookmark the permalink. I totally agree with being aware. I was at a park in the city the other day with the kids, and a friendly guy came up and started talking to me. I didn’t think anything of it at first because I’m a pretty friendly guy myself and talk to strangers all the time. After about a minute, however, my spidey sense started tingling, and it felt like the guy was a little too friendly, and then I realized: maybe this was just a distraction to divert my attention and kidnap my kids. Luckily, nothing happened, but I’m glad that I was aware anyway. Always try to think outside the box. Okay. You make a good point that for some reason I had never considered. What to carry when I can’t, like to the hospital for an appointment. I am always annoyed by the zapping noises of personal tazers, but perhaps I should look more closely at them, or mace. My first thought on that was why do I care if the attacker has asthma; but I presume you meant that the spray fallout could affect the user. I say don’t travel overseas. Several I know cancelled trips this past spring. Too much going on over there and Americans killed in some terrorist attacks like recent one in France. No need to go to these places just not worth it. (Stream Europe from internet on wide screen tv. see even more w/ drone videos online) Also any type smaller knife in woman’s purse or jacket pocket with a shield (Zyliss kitchen knives full tang w/shield- best prices) other smaller tactical knives at sporting goods stores. Plenty of places to see in nat.’ and state parks in usa. Shop early in the day incl errands when stores are sparse with shoppers. Stay out of any type crowds. Regular Bic pen in your pocket. Cheap so you can have these everywhere. I agree, a collapsible baton is my first choice. Reliable and easy to access. Depending on the agent, you may be able to get that through TSA. Attach a short length of pet leash to your key ring and on the ring put one or more heavy legal objects, such as a Leatherman micra in addition to your keys. Makes a terrific flail! Doing that can get you in very deep trouble in my area. It is considered weapon. Canes are also an effective weapon and allowed to be carried on planes. There is not gun violence around every corner in the usa. That’s just what the news chooses to report. And not everyone carries weapons. Most don’t. And most of th e people I know who do carry are responsible and you would never I know they are carrying. Don’t believe everything you read. Be very careful with Mace/pepper spray. 2) when dealing with said enraged individual, you will now be on the receiving end of second hand Mace. Wasp or hornet spray is supposed to be even better then pepper spray. It has a longer spray distance so you dont have to get as close to the predator in order to defend yourself. It also causes blindness and the predator would need to seek medical help to get the medication to stop the effects of the spray. Using insect spray here can get you in deep trouble. You could get arrested for it. The last time I flew was about 2 years ago. I crochet so along with my hook and yarn I was able to carry a pair of pointed scissors (with blade length up to 4 inches) and i took a pair of metal knitting kneels about the diameter of my thumb and ~8 inches long. Both could have made formidable weapons if needed. I put a rubber band around the needles to hold them together and I stuck the scissors into a piece of packing foam to protect my backpack and my back. I just read your article on women’s self defense and wanted to offer that if you ever need a source on the topic, I am available for your research. I am a Certified Self-Defense Instructor and my website is: http://www.DefenseDivas.com I look forward to speaking with you in the future.